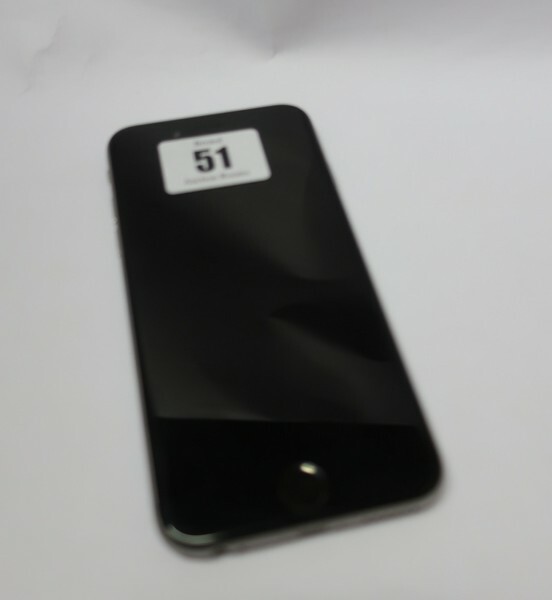 An Apple iPhone 6 A1586 16GB in Space Grey (IMEI: 354427062075665) (Activation clear). Unfortunately, your registration has been declined by the auctioneer. You can contact the auctioneer on +44 (0) 117 953 3676 for more information. You are the current highest bidder! To be sure to win, log in for the live auction broadcast on 16 Jan 2019 10:00 GMT or increase your max bid. Two day auction to include cameras & accessories, iPads, laptops, phones, drone accessories, perfumes, clothing, tools, jewellery & vehicles. The following includes general reports of the condition of the property for various lots in this Sale. The absence of any condition or condition report does not mean, or imply, that the lot is free from any damage or restoration. If you require a condition report, please make a request via e-mail. We are not professional restorers and do not undertake conservation, and we strongly recommend that you consult such a professional of your choice who will be better able to provide a detailed report. Prospective buyers should inspect each lot to satisfy themselves as to condition and must understand that any statement, whether written or verbal made by Bristol Auction Rooms, its staff and agents, is merely a subjective, qualified opinion and is only provided on this basis. Prospective buyers should also refer to any Notices regarding this sale, which are printed in the Sale Catalogue. ALL LOTS ARE OFFERED AND SOLD “AS IS” IN ACCORDANCE WITH THE CONDITIONS OF BUSINESS PRINTED IN THE SALE CATALOGUE, AND ANY REPORT OR VERBAL OBSERVATION IS ONLY PROVIDED ON THIS BASIS. BCVA wipe all electronic devices by factory reset, hard reset, drive wipe and drive removal. For this to be confirmed the device must be powered up and physically checked that the wipe has been completed. Any devices that we cannot confirm as wiped are recycled (Not Sold at Auction) or sold with the storage drive removed. It is the buyer's responsibility to make all necessary checks prior to bidding to establish if the device is blacklisted or blocked and the service provider is able to activate or register the unit. BCVA run checks where possible (detailed within the description). Please note - No refund will be given, even if a unit is sold and subsequently blacklisted/blocked, etc. For one day auctions; Wednesday prior from 10.30am-6pm and day of auction from 9am until start of auction. ‘(AF)’ indicates that the item referred to was found to be damaged when catalogued. The absence of such an indication should not however be taken to suggest that the item is not damaged and intending purchasers should satisfy themselves by inspection in accordance with published Standard Conditions of Sale. ‘SOLD AS PARTS’ indicates that the item referred to is not sold as in working order. It is not sold for use. Do not attempt to use before undertaking a full condition survey by a qualified technician and achieving compliance with Health & Safety requirements. If an electricity lead has been cut through close to the back, this signifies that the item needs re-wiring before use, using the correct colour coding. 20% together with VAT at the current rate (44% in total on Vatable Lots, 24% in total on Non Vatable Lots). 7.5% together with VAT at the current rate for vehicles, plant and machinery sold at 1pm (29% in total for Vatable Lots, 9% in total on Non Vatable Lots). VAT at the current rate will be added to the hammer price of lots indicated in the description as `VAT`, 'VATABLE LOT' or marked with an asterisk (*). We regret we do not offer a packing or shipping service but we can suggest carriers for you to contact for a quote. For further details regarding shipping please contact the saleroom. If sending couriers please make sure that you/they are aware we do not box, wrap or palletise any items, it is solely the responsibility of the buyer. Bristol Commercial Auctions, Yelverton Road, Ashton, Bristol, BS4 5HP is situated off Hungerford Road/West Town Lane just off the main A4 Bath Road. Car parking is available at our premises in addition to on-street parking in Yelverton Road. All prospective purchasers must register with the Auctioneer’s Clerk before the sale, proof of identity and current address is required and a buyers card will be issued for use during the sale. To register to bid live via the internet or follow the sale visit the i-Bidder website www.i-bidder.com and follow their instructions. Bristol Auction Rooms do not accept liability for any failure of these services. Bids may be left with the Auctioneers either through the BCVA website, iBidder website or on the forms provided. All bids are treated in the strictest confidence. Buyer’s Premium at the rate of 20% together with VAT at the current rate on the premium will be added to the hammer price of all lots and will be clearly shown on the Purchaser’s Account. Value Added Tax at the current rate will be added to the hammer price of all lots marked with an asterisk*. A VAT receipt will be given. We operate under the VAT MARGIN SCHEME. Any VAT registered Purchaser requiring a full VAT Invoice (i.e. non margin scheme) PLEASE ADVISE OUR ACCOUNTS DEPARTMENT OR THE AUCTIONEER ON THE DAY OF SALE. We are unable to provide altered Invoices at a later date. All accounts to be settled immediately after the sale. Payment by cash, major credit and debit cards accepted. Account. If arranging collection by an agent, please ensure this is provided. Collection of the purchased lots is at the purchaser’s risk and expense and whilst Bristol Auction Rooms do not provide a packing and despatch service we can suggest some carriers. Bristol Auction Rooms also require that all purchased items are collected within three days of the sale to avoid a storage charge being applied. All motor vehicles are sold with no warranty, including mileometer readings. It is the Purchaser’s responsibility to ensure that they may safely and lawfully be driven on the highway. No transfer of lots by the buyer will be allowed. The Plant, Machinery and Equipment as lotted are used or surplus and are not for use as defined in the Health and Safety at Work Act 1974. It is the buyer’s responsibility to carry out such testing, examination and repairs necessary to ensure that the lots are safe and correctly guarded etc. without risk to health when put into the uses for which they are purchased and comply with the requirements of the Health and Safety at Work Act 1976 and other relevant legislation. It is the buyer’s responsibility to have the necessary testing carried out on all lifting devices, pressure vessels, boilers etc before use, regardless of whether or not they carry current safety certificates. We have not undertaken any formal investigations on equipment which incorporates microprocessor or computer technology unless otherwise stated. ‘(AF)’ indicates that the item referred to was found to be damaged when catalogued. The absence of such an indication should not however be taken to suggest that the item is not damaged and intending purchasers should satisfy themselves by inspection in accordance with published Standard Conditions of Sale. ‘SOLD AS PARTS’ indicates that the item referred to is not sold as in working order. It is not sold for use. Do not attempt to use before undertaking a full condition survey by a qualified technician and achieving compliance with Health & Safety requirements. If an electricity lead has been cut through close to the back, this signifies that the item needs re-wiring before use, using the correct colour coding. The Auctioneers reserve the right to divide, alter, consolidate or withdraw any lots without previous notice before or during the Auction. - Buyers Premium at the rate of 7.5% (plus VAT) will be added to the hammer price. - On the sale of commercial vehicles, in addition to the Buyers Premium, VAT at the current rate will be added to the hammer price. - All motor vehicles are sold with no warranty, including milometer readings. It is the Purchaser’s responsibility to ensure that they may safely and lawfully be driven on the highway. - Payment of vehicles/ large plant & machinery will only be accepted by cash, bankers draft, building society cheque or credit/debit cards. (Credit cards are subject to an additional 3% surcharge). - Vehicles/large plant and machinery not paid for and collected by 5pm on the Friday following the sale will be subject to a storage charge of 5 (plus VAT) per day or part thereof. Bristol Auction Rooms and/or BCVA carries on business with bidders, buyers and all those present in the auction room prior to or in connection with a sale on the following General Conditions and on such other terms, conditions and notices as may be referred to herein. (b) the maker of the highest bid accepted by the auctioneer conducting the sale shall be the buyer at the hammer price and any dispute about a bid shall be settled at the auctioneer’s absolute discretion by reoffering the Lot during the course of the auction or otherwise. The auctioneer shall act reasonably in exercising this discretion. (d) Our right to bid on behalf of the seller is expressly reserved up to the amount of any reserve and the right to refuse any bid is also reserved. together with a premium thereon of 24% which shall include VAT on the premium at the rate imposed by law. The buyer will also be liable for any royalties payable under Droit de Suite as setout under Information for Buyers above. (b) pay to us the total amount due or in such other way as is agreed by us. (3) Buyers who utilise the services of ATG Live Auctions or any other live internet services are hereby informed that the payment method details that are provided to ATG Live Auctions or any other live internet services as part of the process of registration will, in the absence of compliance with paragraph (1) of this clause, be utilised by us to settle any amounts owing by such buyers to us. (4) Bristol Auction Rooms are unable to arrange packaging or shipping of items. Successful buyers must make these arrangements independently, though the saleroom may be able to suggest specialist shipping companies who can advise buyers, this advice is not a recommendation and the saleroom is not liable for any aspect of the packaging and shipping process. Please note that the cost of packaging and shipping depends on the size/weight of the item(s) purchased, insurance requirements, and the shipping destination, not on the value of the item(s) purchased. Please note that any items not collected within one week of the sale date may be automatically removed to commercial storage and subject to a storage charge. Whilst prospective buyers are strongly advised to attend the auction and are always responsible for any decision to bid for a particular Lot and shall be assumed to have carefully inspected and satisfied themselves as to its condition we will if so instructed clearly and in writing execute bids on their behalf. Neither the auctioneer nor our employees or agents shall be responsible for any failure to do so save where such failure is unreasonable. Where two or more commission bids at the same level are recorded we reserve the right in our absolute discretion to prefer the first bid so made. Notwithstanding the preceding Condition, any Lot which proves to be a deliberate forgery (as defined) may be returned to us by you within 21 days of the auction provided it is in the same condition as when bought, and is accompanied by particulars identifying it from the relevant catalogue description and a written statement of defects. If we are satisfied from the evidence presented that the Lot is a deliberate forgery we shall refund the money paid by you for the Lot including any buyer’s premium provided that (1) if the catalogue description reflected the accepted view of scholars and experts as at the date of sale or (2) you personally are not able to transfer a good and marketable title to us, you shall have no rights under this condition. 18. Any notice to any buyer, seller, bidder or viewer may be given by first class mail, email or Swiftmail in which case it shall be deemed to have been received by the addressee 48 hours after posting.